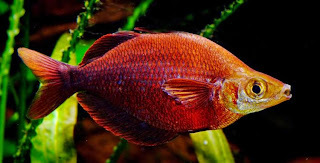 Tami River rainbow fish is a beautiful red color fish like Salmon red rainbow. Lot of discussion is happening regarding the two species and the possible difference in identifying them. But in today’s aquarium trade, it is very difficult to avoid cross breading. Since I have seen several different rainbow tried to crossbreed when mixed together. Males will be bright red in color and mature males will have a arched back . Females are less colorful.